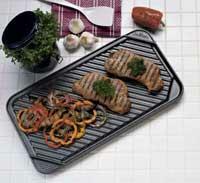 The perfect griddle for singles or couples. The 8 1/2- x 10 1/2-inch cooking surface is perfect for one or two servings. Control Master heat control automatically maintains the perfect temperature. DiamondCoat deluxe nonstick finish provides stick-free cooking and easy cleaning. 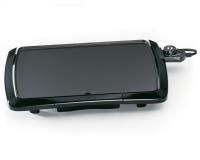 Built-in grease tray catches cooking drippings. I have always preferred Presto electric appliances over others. They are always very dependable and stand behind their product. I have used them for years and have no complaints on any of their appliances. I had bought one for myself and liked it so much that I had one shipped to my daughter. It's perfect for 1 or 2 people who have a small kitchen. I would not be without this handy griddle. I use it everyday. I have very little counter space and when I found this it was the ideal thing for 2 people. I have gotten 4 so far. my son loves his in the camper. When the kids come it is so nice to have one daughter in law in one corner of kitchen cooking the bacon and the other daughter in law in another cooking the eggs while I am making the home fries, all on my mini griddles. don't know how I did it with out them. got to order more for my friends. hope they never go out of stock. Wish they had a lid to go along with them. I took a old small cake pan and put aq knob on top and made my lid for one of them. got to find more small cake pans for the others. I would not be without this handy griddle. I use it everyday. I have very little counter space and when I found this it was the ideal thing for 2 people. I have gotten 4 so far. My son loves his in the camper. 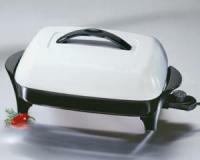 When the kids come it is so nice to have one daughter in law in one corner of the kitchen cooking the bacon and the other daughter in law in another cooking the eggs while I am making the home fries, all on my mini griddles. I don't know how I did it with out them and I have got to order more for my friends. We hope they never go out of stock. My children had these griddles, and now I have bought them for my grandchildren. They are great! This is a handy little griddle for 2 people. I would be lost without it! Best size griddle I've ever owned. So good I gave them to the kids for their first apartments. When you have limited space you can't beat it! 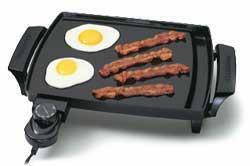 This is a great griddle and the perfect size! This item is easy to assemble and use. It is also easy to clean as it is submersible. I am very satisfied with the griddle.